Otar (Kazakhstan), September 11, (Scoop News)- India and Kazakhstan on Tuesday conducted a joint military exercise, Kazind-2018, in the Otar region of Kazakhstan. 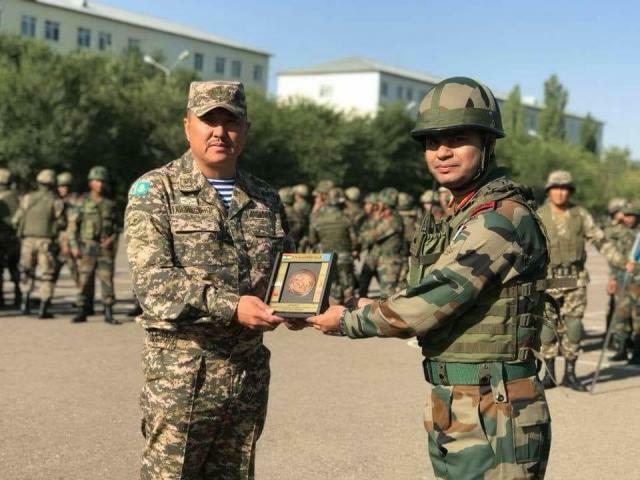 According to defence spokesman that Exercise KAZIND-2018, a joint military exercise between Indian and Kazakhstan Armies, commenced on 11 Sep 2018 in Otar region which is approximately 175 Kms from Almaty, Kazakhstan with an impressive opening ceremony that saw the unfurling of the national flags of both countries to the tunes of 'My Kazakhstan' and 'Jana Gana Mana'. Kazakhstan and Indian soldiers stood side by side and gave ceremonial salute to the senior most officer of the Kazakh Army reviewing the ceremony. This is the third edition of joint military training exercise between Indian Army and Kazakhstan. He said that the Kazakh contingent was represented by Military Base 85395 while the Indian side was represented by 5 LADAKH SCOUTS Regiment. General Major Dzhumakeev Almaz, Deputy Commander of Army for Battle training, Kazakhstan Army welcomed the Indian contingent and in his inaugural remarks highlighted the common shared beliefs of freedom, equality and justice that are precious to both the nations. The magnificent opening ceremony conducted today started with briefing on Army organization and country presentation by both countries including display of weapons and equipment used by the Kazakhstan Army at sub-unit level. Spokesman further said that the fourteen day joint training aims to build & promote army to army relations and exchange skills & experiences between Indian Army and the Kazakhstan Army. Due emphasis will be laid on increasing interoperability between forces from both countries which is crucial for success of any joint operation. Both sides will jointly train, plan and execute a series of well developed tactical drills for neutralisation of likely threats that may be encountered in urban warfare scenario. Ex KAZIND-2018 will contribute immensely in developing mutual understanding and respect for each other’s military.